When it rains, it pours in Hong Kong. 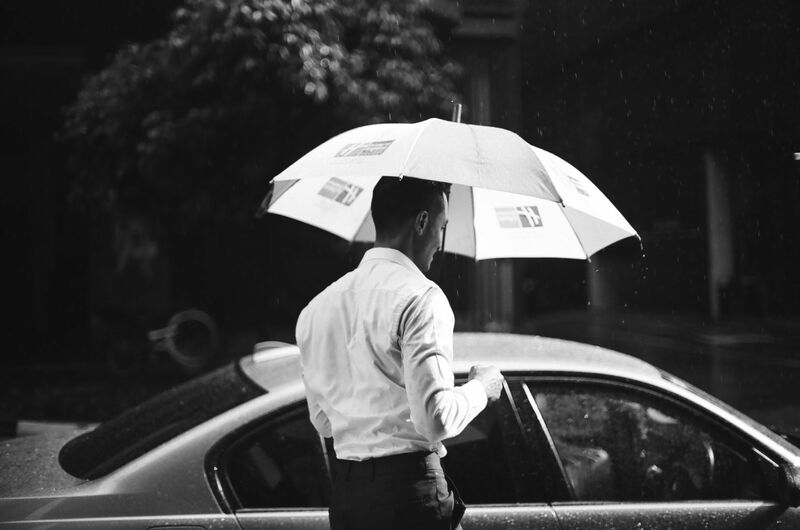 Rather than curse those wretched raindrops as you dodge umbrellas, take cover with these stylish rainy day essentials for men. From a luxury umbrella to fashionable jackets and office-ready shoes, these items will protect you from the elements–without you looking like a yellow, plastic-coated Gene Kelly in Singin’ In the Rain. Swedish raincoat maker Stutterheim teamed up with Italy’s Marni for a high-end version of its best-selling long coat. The oil black hooded coat has contrasting yellow stitching and matte panels, functionalised with two flap patch pockets and double-welded seams to keep the rain at bay. In black neoprene, these Prada sneakers are made for rainy urban jungle walks. The buckled footwear features a classic round toe and pull-tab at the rear, with a ridged rubber sole and racey red details. On your marks. The Italian cashmere specialist released its traveller field jacket for your next wet weather adventure. Crafted in water-repellent linen, the chevron natural weave boasts a built-in hood, four front pockets and a funnel neck. A cinched waist gives the casual jacket some shape, with just a pull of a drawstring. Allen Edmonds’ ‘Dayton’ oxford lace-up boot is the perfect formal footwear for rainy days. Cut from burgundy Cordovan—a waterproof equine hide—the American boot maker’s wingtip blucher is designed by architect Jim Dayton. With a hefty sole, brogue perforations and toe medallion, it boasts a heritage richness with suit trousers, chinos, or even summer jeans. What’s a coat that shields you from the rain, but is not actually a raincoat, per se? Burberry’s car coat (circa. 1980s) comes in a cotton-blend gabardine that’s water-resistant with a single-breast closure and button tab cuffs, and is made in the maison’s stately heritage woollen check. Just flip it inside out, and voila, you’ve got a goes-with-everything black coat, too. In the sea of umbrellas, make sure you stand out from the crowd. Francesco Magalia, the maestro ombrellaio, handcrafts elegant umbrellas in Milan. This ‘Lord’ model is the sovereign style out now, and features beautiful details: chestnut wood handles and a polkadot twill fabrication to stylishly outsmart those heavy downpours. Made in America using Swiss 100% cotton, the Best Made Co.’s new range of waterproof caps are perfect for the outdoors. The bold red colour is fashion fire, and without being coated or laminated, you’ll have all the protection you get from a technical hat fabric without looking like you’re going to hit the gym. Non-leather bags don’t carry that ‘cheap’ stigma like they used to, and Gucci is proof with its luxury rubber bag. The Italian label’s woven multicolour tote features Gucci stripe detail—taken directly from this season’s Gucci track suit—and its simple, unlined construction makes this a match made in rainy heaven when it comes to getting a little damp. Rendered in water-resistant tarpaulin, Herschel’s distinctly pink duffle offers protection against the elements. Check out the webbing carry handles and seatbelt straps that make this weekender/gym bag cleverly contemporary. Saint Laurent’s black skinny jeand are conveniently wax-coated so raindrops will bounce right off, unless it’s torrential rain, in which case simply run for cover, or get that umbrella.